Whenever I try to package my Android game, it gives me this error message in the output log, and thus it doesn't package my Android game (if you are having trouble reading the red text, it says "PackagingResults:Error: Error Unknown Error"). How can this be fixed? Thanks! Note: I'm not sure whether or not this is related to the error, but it also gives me this warning earlier on. During the packaging process, it also keeps telling me to insert a disc, which I do. However, when I click "Try Again," it keeps giving me that message a couple of times before going away, but I think it resulted in some sort of warning: "PackagingResults:Warning: Warning Warning Unable to find package for cooking /Game/Blueprints/BF3GameMode"
After reviewing the logs provided, I see that you're having trouble with VaderAnim. Please correct those compiling issues. the rest of the issues I see seem to relate back to some files not being able to be found. Make sure none of your blueprints are calling for an asset you deleted. MainFrameActions: Packaging (Android (ETC1)): UE4Editor-Cmd: [2016.04.19-22.23.49:263][  0]LogInit:Display: LogLinker:Warning: Asset '../../../../../../Users/Holly/Downloads/Source4/Repo/BF3/Content/Maps/MPMAP.umap' has been saved with empty engine version. The asset will be loaded but may be incompatible. MainFrameActions: Packaging (Android (ETC1)): UE4Editor-Cmd: [2016.04.19-22.23.49:302][  0]LogInit:Display: LogLinker:Warning: Asset '../../../../../../Users/Holly/Downloads/Source4/Repo/BF3/Content/Characters/Player/Player.uasset' has been saved with empty engine version. The asset will be loaded but may be incompatible. MainFrameActions: Packaging (Android (ETC1)): UE4Editor-Cmd: [2016.04.19-22.23.49:303][  0]LogInit:Display: LogLinker:Warning: Asset '../../../../../../Users/Holly/Downloads/Source4/Repo/BF3/Content/Characters/Republic/X1/X1Anim.uasset' has been saved with empty engine version. The asset will be loaded but may be incompatible. MainFrameActions: Packaging (Android (ETC1)): UE4Editor-Cmd: [2016.04.19-22.23.49:341][  0]LogInit:Display: LogLinker:Warning: Asset '../../../../../../Users/Holly/Downloads/Source4/Repo/BF3/Content/Blueprints/Main/BF3Hud.uasset' has been saved with empty engine version. The asset will be loaded but may be incompatible. MainFrameActions: Packaging (Android (ETC1)): UE4Editor-Cmd: [2016.04.19-22.23.49:341][  0]LogInit:Display: LogBlueprint:Warning: [compiler ShipParentBP] Warning  Cast to Player Controller  is deprecated; Use standard Cast To node instead. MainFrameActions: Packaging (Android (ETC1)): UE4Editor-Cmd: [2016.04.19-22.23.49:343][  0]LogInit:Display: LogBlueprint:Warning: [compiler SettingsMenuMain] Warning Event Reply  Return Value  should not be empty. Return a reply such as Handled or Unhandled. MainFrameActions: Packaging (Android (ETC1)): UE4Editor-Cmd: [2016.04.19-22.23.49:344][  0]LogInit:Display: LogLinker:Warning: Asset '../../../../../../Users/Holly/Downloads/Source4/Repo/BF3/Content/Blueprints/EnemyAIFolder/Tasks/LookAtPlayer_MoveAround.uasset' has been saved with empty engine version. The asset will be loaded but may be incompatible. MainFrameActions: Packaging (Android (ETC1)): UE4Editor-Cmd: [2016.04.19-22.23.49:371][  0]LogInit:Display: LogMaterial:Warning: Failed to compile Material /Game/ThirdParty/FXVillesBloodVFXPack/Materials/MAT_GibChunk_Skull.MAT_GibChunk_Skull for platform GLSL_ES2, Default Material will be used in game. MainFrameActions: Packaging (Android (ETC1)): UE4Editor-Cmd: [2016.04.19-22.23.49:372][  0]LogInit:Display: LogRedirectors:Warning: String Asset Reference '/Game/Blueprints/BF3GameMode.BF3GameMode_C' was not found! MainFrameActions: Packaging (Android (ETC1)): UE4Editor-Cmd: [2016.04.19-22.23.49:442][  0]LogInit:Display: LogRedirectors:Warning: String Asset Reference '/Game/SciFi_Weapons/Meshes/St_Shockwave_01.St_Shockwave_01' was not found! MainFrameActions: Packaging (Android (ETC1)): UE4Editor-Cmd: [2016.04.19-22.23.49:513][  0]LogInit:Display: LogRedirectors:Warning: String Asset Reference '/Game/Realistic_Weapons_Pack/Meshes/St_Tracer_A.St_Tracer_A' was not found! MainFrameActions: Packaging (Android (ETC1)): UE4Editor-Cmd: [2016.04.19-22.23.49:576][  0]LogInit:Display: LogRedirectors:Warning: String Asset Reference '/Game/SciFiWeapDark/Weapons/Darkness_RocketLauncher.Darkness_RocketLauncher' was not found! MainFrameActions: Packaging (Android (ETC1)): UE4Editor-Cmd: [2016.04.19-22.23.49:584][  0]LogInit:Display: LogRedirectors:Warning: String Asset Reference '/Game/SciFi_Weapons/Meshes/St_AssualtRifle_Core_01.St_AssualtRifle_Core_01' was not found! MainFrameActions: Packaging (Android (ETC1)): UE4Editor-Cmd: [2016.04.19-22.23.49:587][  0]LogInit:Display: LogRedirectors:Warning: String Asset Reference '/Game/BloodPack/Content/Meshes/SM_GibChunk_Skull.SM_GibChunk_Skull' was not found! MainFrameActions: Packaging (Android (ETC1)): UE4Editor-Cmd: [2016.04.19-22.23.49:587][  0]LogInit:Display: NOTE: Only first 50 warnings displayed. 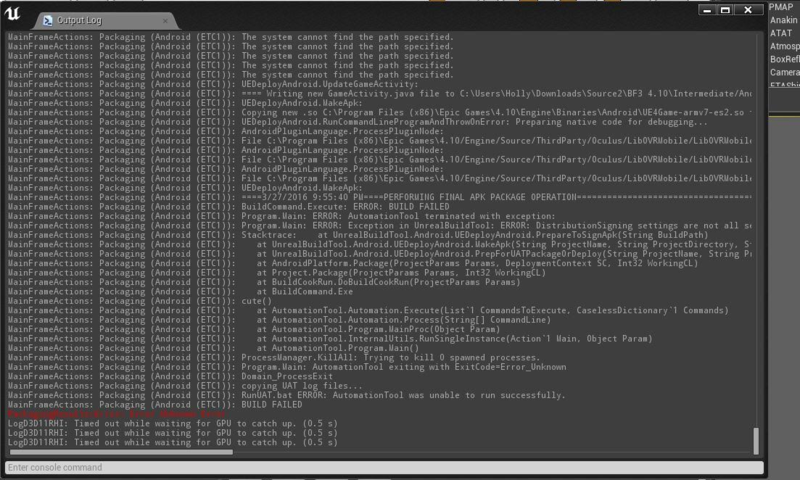 I thought Unreal Engine automatically corrects those errors like Unity, no? If the project has a missing file, or something is not hooked up correctly in blueprints, the editor will not correct them. You'll need to go back to the asset/file that has an error and make the correction. If you've moved or renamed an asset, you can use fix up redirectors by right-clicking in the content browser. Once you've went through your files that are listed, feel free to upload your newest logs and I can continue to assist you. Try turn off all the plugins you don't use, Fix redirectors (right click content folder -> Fix redirectors) then try build before cook. "And try build before cook." What's that? Well, I did both of your methods, and it still results in that error. Are you sure "package before cook?" Are you still experiencing packaging troubles? If so, could you please upload new output logs from your project? Yes, but now it freezes after packaging for awhile. Should I cancel the packaging or let it continue? Also, since the last time I was here, I updated both Unreal Engine and Visual Studio to their latest versions and updated the game's code a little. Edit: Now it says "Timeout processing Http request," and continues. I'll just upload the output log text later if there's an error and the packaging stops. Are you on a Binary or Source version of the engine? If you're on a Binary version of the engine and your project is C++, then it might take longer to package. If you're on a Source version of the engine, in general, it'll take longer than Binary. If it is a small project and it goes longer than an hour, I would stop it and just upload those output logs. Make sure that you're testing the packaging out on a blank template, we want to see if you can replicate the issue too. I don't think it's the Source version. 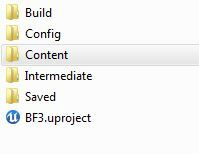 I'm using the one that can be downloaded from Epic Games Launcher, and the project is C++.